"The problem with her and I is that, you know the song Pretty Woman, I prefer the Roy Orbison version - the original version - and she prefers the Van Halen version, and this has been the source of our pain." Welcome to the FrankBlack.Net eBook Library. Here, you will find what we hope will become a collection of literary and artistic efforts from FrankBlack.Net members. While the forum already hosts members' art and links to their projects, musical and otherwise, it was hoped that the eBooks would collate these works into one source which could be enjoyed by all. Whilst we have many established authors on the site, the call was also made to those who have never strung words together for such a purpose. The forum as a community has undertaken some impressive projects in the past, like the highly successful tribute albums, and this community spirit has been both enhanced and captured by the forum eBooks. Thank you for reading; I hope you enjoy it as much as we enjoyed creating. This is the pilot project and the theme is a recurring motif that is present throughout the music that unites all of the authors that have contributed. It was loosely designated as 'On the Road'. The title was polled and democratically decided and this is how we arrived at End Of Miles. 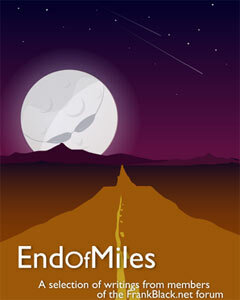 End of Miles is an impressive body of work comprised solely of writing and artwork by members of the Frank Black Forum.